For those who need service in Kamloops, Optimum Security is available for comprehensive home and business security that’s relied on by many today. Our dedicated team of professionals offer a wide range of services. We hire and work with only the most well trained and dedicated professionals. We use only the best resources to ensure complete success. In addition, our team works closely to local law enforcement in Kamloops to ensure ongoing, complete satisfaction and safety in the region. 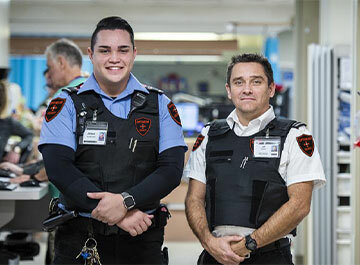 Optimum Security’s Kamloops security guards are available to handle any type of property, asset, or people security needs. Our team is uniformed and respected. They maintain a high level of visibility on any jobsite, deterring crime and ensuring the fastest possible response when necessary. Our team uses video cameras and monitors all alarm systems. And, we are committed to ensure full satisfaction of our clients no matter the type or challenge of the jobsite. Our Kamloops security services are comprehensive. We offer both residential and commercial alarm services designed to detect any type of invasion. In addition, our systems can also keep homeowners safe by offering detection of fire, smoke, and carbon monoxide or changes in temperature. To facilitate the fastest service for managing these risks and others, the system offers two-way, hands-free communication. This lets those onsite alert the authorities immediately. More so, we also offer uniformed security officials in Kamloops. When you are not home, this type of monitoring services extend to offer the best level of protection possible. We’re committed to providing comprehensive security services in Kamloops to businesses and residents in the area. To learn more about how we can help you, give our team a call now.